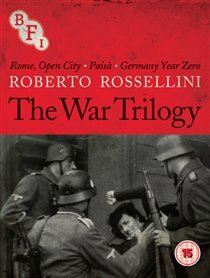 Collection including a trilogy of war films and the controversial ‘L’amore’ (1948) directed by Roberto Rossellini. ‘Rome, Open City’ (1945) is a drama about the last days of the Nazi occupation of Italy during World War II. Resistance leader Giorgio Manfredi (Marcello Pagliero) flees the Gestapo and seeks a place to hide with the help of his friend Francesco (Francesco Grandjacquet), his pregnant fiancée Pina (Anna Magnani) and the priest who is due to marry them, Don Pietro Pellegrini (Aldo Fabrizi). Giorgio’s ex-girlfriend Marina (Maria Michi) betrays him and his fellow fighters to the Gestapo in order to get her hands on some luxury items and it’s not long before the Nazis and the local police find him and Don Pietro. They are captured and tortured but will they crack under the pain or be executed for their silence? ‘Paisà’ (1946) is Rossellini’s account of the liberation of Italy during World War II told in six chapters. In each chapter a different view of the liberation is given as it spreads across the country. Different characters are also followed in each segment including American chaplains, soldiers, monks and prostitutes. ‘Germany Year Zero’ (1948) is the moving account of life in post-war Germany, telling the story of a 13-year-old black marketeer who poisons his ailing father out of pity and necessity. In ‘L’amore’ (1948), a vagabond (Federico Fellini) convinces a woman (Magnani) to sleep with him by telling her that he is Saint Joseph, causing her to think she will give birth to Jesus Christ. Available for the first time on Blu-ray in the UK, these stunning films by master filmmaker Roberto Rossellini are all undisputed classics of World Cinema. This limited edition Blu-ray box set includes Rossellini’s celebrated War Trilogy, made during and immediately after World War II – Rome, Open City, Paisà and Germany Year Zero – as well as his controversial 1948 film L’Amore starring Anna Magnani and Federico Fellini. These are the films that established Roberto Rossellini as one of the most important and influential filmmakers of all time.